MKB Law are delighted to have recently acted for a client in a successful appeal from the Lands Tribunal to the Court of Appeal. Jonathan Jackson, solicitor with carriage of this matter before the Lands Tribunal and the Court of Appeal, has provided an overview of the legal issues at stake and the potential legal implications of the Court of Appeal’s judgement on business owners. By Jonathan Jackson – Associate Director, Litigation Dept. Published 23 May 2018. 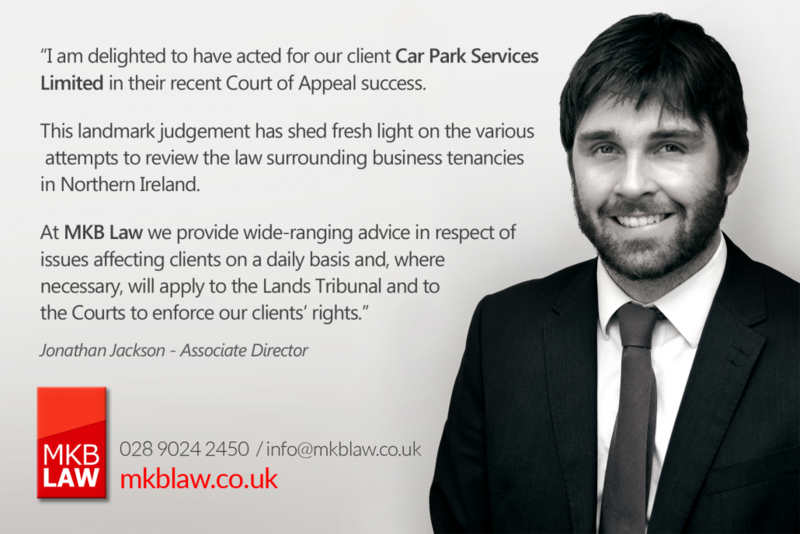 MKB Law acted for Car Park Services Limited (our “client”), the occupier and car park operator of premises at Winetavern Street, Belfast (the “car park”). Throughout this matter, the only requisite ingredient in dispute was exclusive possession. Lease or a Licence: Why does it matter? ii. Payment of a potentially significant sum of compensation which requires to be paid by the landlord to the tenant upon the determination of the tenancy, even if at least one of the grounds permitting determination is proven. This sum will increase depending on various factors including the length of time a tenant has been in possession. This matter was first brought before the Lands Tribunal following an application by our client under the Order for a new tenancy. A request for a new tenancy seeks agreement on various issues, most notably the term and rent for any new tenancy. 2. That, even if our client did have a lease, it did not have a lease of the kind that permitted it to apply for a new tenancy (pursuant to Article 7 of the Order). The Lands Tribunal, with Mr Justice Horner sitting as President, held that our client did not have a lease. It was, however, also held that had the Agreement been deemed a Lease then our client would have been entitled to apply for a new tenancy under the Order. The ruling of the Lands Tribunal in favour of our client on the second issue is likely to have a significant impact for many tenants who, previously, may have been advised that they are not in a position to apply to the Lands Tribunal to address the terms of their occupation. In determining that our client did not have a lease, the Lands Tribunal considered the background to our client’s occupation, including witness statements from the original parties, and sought to carefully construe the terms of the Agreement. Whilst it was accepted by the Lands Tribunal that this clause was not determinative, the decisive factor in the Lands Tribunal’s conclusion was the fact that both entities were experienced in business, had benefited from independent legal advice, and that, “clause 12 could not be clearer. The objective intention of both parties captured in this clause is that the applicant will have a licence, that he will not have exclusive possession and that the relationship will not be that of landlord and tenant” [Paragraph 27 of the Lands Tribunal’s Decision]. Our client’s appeal centred on submissions that clause 12 of the Agreement was simply a label and should not be read in isolation. That is to say, without careful analysis of the other operative terms of the Agreement, it was impossible to determine whether exclusive possession had or had not been granted. It was accepted by both parties that the question of whether exclusive possession had in fact been granted by the Agreement would be determinative. The focus of our client’s case, as presented to the Court of Appeal, was to prove that our client enjoyed exclusive possession of the car park. A central tenet of this argument was demonstrating how, without exclusive possession, the Agreement in place between the parties simply would not work. The very purpose of our client’s occupation of the car park was to carry out its commercial car parking operation. The need to obtain an income stream from car park users would be frustrated if the landlord or others could interfere with that exclusive possession at any time. A key principle raised on behalf our client was that if the Lands Tribunal’s decision was allowed to stand it would effectively sanction a “contracting out” mechanism. This would mean that parties to a lease of business premises could, by introducing a similar “labelling provision”, contract out of the protection of the 1996 Order and the significant attendant obligations and restriction. In England and Wales the broadly comparable business tenancies legislation, The Landlord and Tenant Act (as amended), expressly permits contracting out. This is not the case in Northern Ireland. Despite being considered by a Law Reform Advisory Committee (the “LRAC”) prior to implementation, and being reviewed by the Law Commission in 2011, the legislature in Northern Ireland has consistently rejected any system for contracting out. The rationale behind this has largely been driven by the perception that business tenants in Northern Ireland tend to be smaller and possess unequal bargaining power when compared to their respective landlords. As a matter of fact, the present case did not involve the contemplated unequal bargaining position, as highlighted in the Lands Tribunal’s initial decision which made reference to the relationship between the parties in this case as not being “asymmetrical”. Edwin Johnson QC, counsel for our client, submitted that allowing any assessment to consider respective bargaining positions was unsatisfactory. If the Agreement in in the present case was held to be a licence, it was foreseeable that a situation could arise where a tenant, running the proverbial “corner shop” with clearly “asymmetrical” bargaining power to his or her landlord, may be required to agree to a similar labelling provision despite his or her occupation bearing all the hall marks of the lease. If the implications of this illustration are considered, “contracting out” would effectively be introduced by the back door. In short, any requirement for an analysis of comparative bargaining positions in each individual case would lead to an unsatisfactory, and uncertain, state of affairs. The Court of Appeal allowed our client’s appeal by a majority of 2:1 and held that our client holds a lease of the car park. Lord Justice Stephens concluded in his majority Judgement that “approaching the agreement by considering its operative terms leads to the conclusion that it [clause 12 of the Agreement] was a pretence given all the other indicators in the agreement and the surrounding circumstances” [para 60]. Addressing Sir John Gillen’s dissenting judgement, he further stated that he “remained of the view that the 1996 Order is to protect tenants and its purpose is not restricted to the protection of particular categories of tenant” [para 38 of his Judgement]. The Judgement of the Court of Appeal has shed fresh light on the various attempts to review the law surrounding business tenancies in Northern Ireland. The dissenting judgement of Sir John Gillen, in particular, places the spotlight on certain circumstances in which contracting out may be desirable by both parties. However, what the Court of Appeal’s judgement makes clear is that until such times as the legislature sees fit to enact amendments to the Order, or to repeal it, the substance of any agreement between landowners should be carefully scrutinised to ensure the purpose of the Order is not being subverted. MKB Law has significant experience in advising clients about the landlord/tenant relationship and property rights in general. I work closely with my colleagues in the commercial property department to provide wide ranging advice in respect of issues affecting clients on a daily basis. Where required, MKB Law has significant experience in applying to the Lands Tribunal and to the Courts to enforce our clients’ rights.